According to Endometriosis UK surgical treatment of endometriosis – a condition where the lining of the uterus grows outside of the womb – does improve fertility and help pain. The charity also says it takes an average of 7.5 years to gain a diagnosis so is encouraging women to seek advice early, particularly if they have unusually heavy or painful periods. 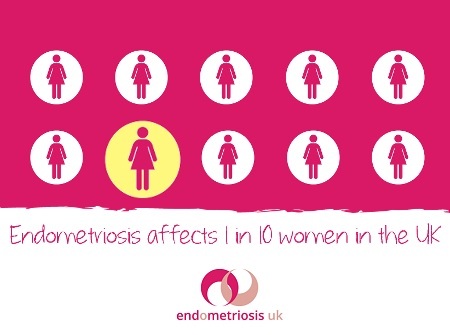 There is an association between infertility and endometriosis but cause has not been fully established, and even with severe endometriosis many women conceive naturally. It has also been found that pregnancy helps to clear the condition in some women who have conceived with IVF and they can go on to have further children naturally. Endometriosis is classified into minimal, mild, moderate and severe using the American Fertility Society Revised Classification of Endometriosis (AFS) score. This classification helps to predict the chance of getting pregnant naturally and does not always agree with the degree of pain. It is possible to have severe pain with minor endometriosis and minor pain with severe endometriosis. During diagnosis the pelvis is carefully inspected and a score is worked out from the area affected by endometriosis, whether there are cysts of endometriosis on the ovaries and whether there is scar tissue or adhesions sticking tissues together. Scar tissue looks like cobwebs and is more common in moderate and severe endometriosis. If the ovary is wrapped in adhesions, the released egg gets trapped and is unable to reach the tube. The tubes and ovaries dangle down in another important area called the Pouch of Douglas. If this pocket is covered by adhesions, then the chance of getting pregnant is also lower. Endometriosis affects about 3 percent of women of reproductive age and yet is diagnosed in over 20 percent of women studied for infertility (some researchers put it at 68 percent). The causal link between the lesions seen in endometriosis and infertility is much debated and so is the value of surgical removal which is generally by cutting out (resection), destruction by heat (ablation) or laser treatment. To see if surgery had a benefit researchers (Marcoux et al., 1998) compared surgical treatment of minimal to mild endometriosis with a control group of women that only had diagnostic-laparoscopy. The study found that surgery improved the chances of pregnancy. In the treated group, 50 of 172 (31%) became pregnant within 36 weeks compared to 29 of 169 (18%) in the control group – however 4 of these women had subsequently treated with clomiphene citrate therapy, so the benefit of surgery may be under-represented in the study. Miscarriage rate in both groups was 20%. Fecundity rate of women who underwent surgery (6.1 percent) was still lower than that expected of fertile women (20 percent) suggesting that destruction of visible endometriotic implants did not overcome all the factors impacting fertility. This study also suggests that it is reasonable for younger women to wait about a year after the operation to see if they get pregnant naturally before going on to fertility treatment. Sutton C.J., Ewen S.P., Whitelaw N., Haines P (1994). Prospective randomised double- blind controlled trial of laser laparoscopy in the treatment of pelvic pain associated with minimal, mild and moderate endometriosis. Fertility and Sterility 62: 696-700. Sutton C.J., Polley A.S., Ewen S.P., Haines P (1997). Follow-up report on a randomised controlled trial of laser laparoscopy in the treatment of pelvic pain associated with minimal to moderate endometriosis. Fertility and Sterility 68: 1070-4.